Bite Silverware – Awareness of starvation and obesity. 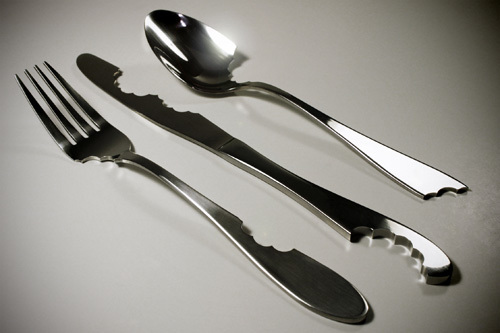 Mark A. Reigelman II has created this Bite silverware as part of a design competition. From what research I’ve done, it never went into public production. But it is a gorgeous design either way that has a strong message. 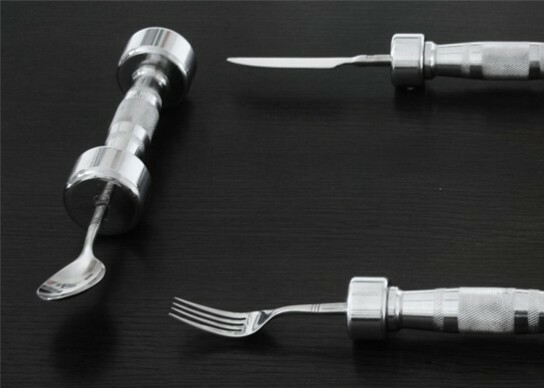 The folks over at Mashable.com have a great article about exercise cutlery that is basically dumbbells attached to your fork, knife and spoon. Their picture caught my eye because of the Full English Breakfast. The knife and fork are 1kg and the desert spoon is 2kg because you need the extra work out when eating all that sugar I guess. 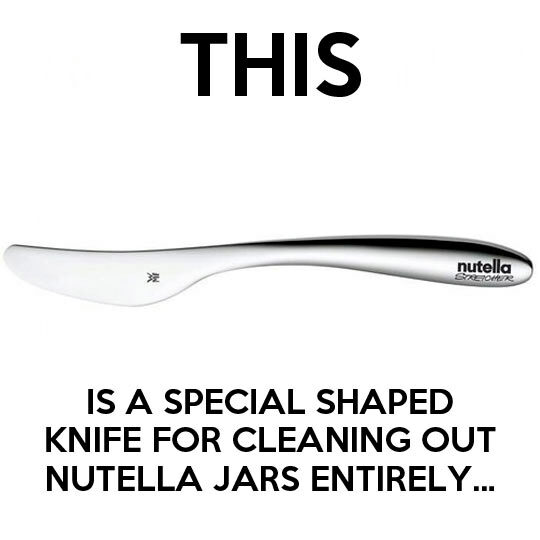 It’s a silly idea, not very practical and a little expense for a unique handmade product. But if someone you know is a fitness buff (or should be) it would be a great gift. OK, I broke another measuring spoon. That’s the fourth set in recent memory. I’ve been buying both metal and plastic and am sad to say they are from the Dollar Store. The plastic breaks and the metal bends or rusts. And sometimes they just get lost for which I blame the cat. I used to travel a great deal and found myself replacing my luggage all the time because the airlines would destroy it. I finally asked a flight attendant for advice and she said spend $600 now on a travel case and never spend again or $60 every six months for the rest of your life. This rule applies to measuring spoons it seems, but at a lot lower cost. 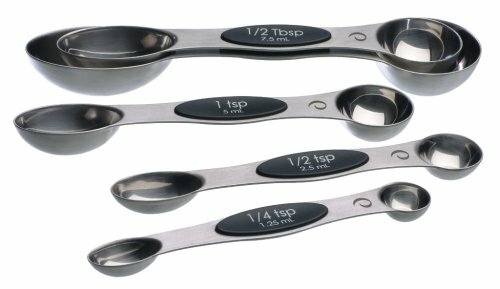 These five stainless steel spoons come in 1/4 tsp, 1/2 tsp, 1 tsp, 1/2 Tbls, 1 Tbls sizes. Thanks to magnets they “spoon” together while stored to avoid the cat stealing one (what does he do with the things?). The rounded ends are for liquids and the narrow end to fit into spice bottles and being doubled ended works well for wet/dry mixing. Dishwasher safe and designed to sit flat on the counter to avoid spillage. They are not $600 and probably the final set of measuring spoon cutlery you’ll need to buy.